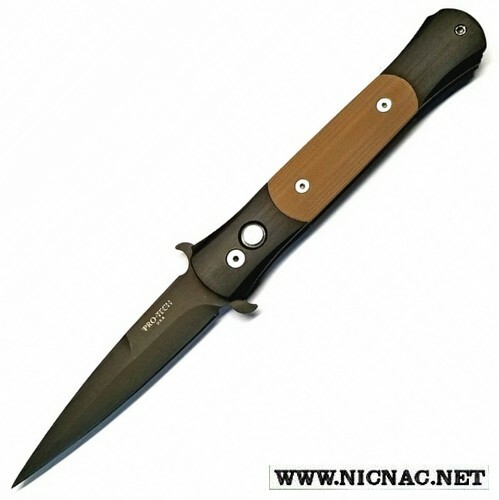 Protech Don auto knife Coyote Brown DLC Black 1738, overall open length 8.10 inches with a 3.50 inch blade. Protech Don automatic knife Coyote Brown DLC Black blade 1738, Black aluminum handle with fully 3D machined curved surfaces, Coyote Brown G-10 inlays, DLC Black blade. SPECS: Overall length 8.1". The Don weighs in at 2.4 ounces. BLADE: 154-CM Stainless Steel 3..5" long, 0.110" thick. Handle: 6061-T6 Aluminum, 4.6" Long, 0.9" Wide, 0.45" tapered to 0.37" Thick. Made in the USA.